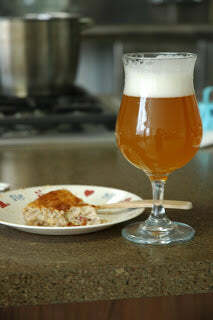 Cooking with beer can be a real challenge, due to the fact that beer is often one of the only sources of bitterness in a person's diet. Bitterness is a taste that is rarely considered desirable in cooking, as it tends to invoke a negative response on the palate. Part of the reason may come from the primal association of bitterness with poison. Conversely, many animals seek out sweetness, because sweetness often indicates fat, sugar, and protein - all the things we find desirable in our diets. The tendency to seek out sweetness is particularly emphasized in desserts, where humans have, for much of civilized society, indulged their love of the sweet sensation on the tongue. Even if you are not an avowed possessor of a sweet tooth, you are likely to have at least one dessert that you value above all others. Dessert is also a natural place for pairing with beer - from roasty stout to sweet and sour kriek. There is a balancing act with any attempt at fusion, especially so with food and beer. Though extremity may rule the trendosphere, classic preparations always focus on balance. Vlaai met witbier is an extremely simple dish with a long history - a dish with no translation into French or English - dating back to Medieval times, it has the texture of bread pudding, the richness of waffles drenched in syrup, and a hint of rustic heartiness from dried fruit. Witbier brings a spiciness, a fluffy, airy richness, and a panoply of exotica. Though all these disparate elements may decry the emphasis on balance, they unite in a heavenly combination. Like Belgian waffles and Duvel, this dish is a classic expression of Flemish ingenuity. Pair with another glass of witbier, your favorite Belgian strong golden ale, or even a stange of Kolsch for the truly heretical. Procedure for Vlaai 1.) Preheat the oven to 400. 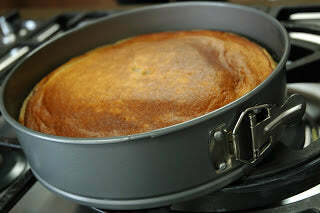 Butter/grease a 9" springform pan, or 10 individual ramekins. 2.) Pour the milk into a medium-size saucepan. Add the vanilla, scraping the seeds from the bean. Bring to a simmer over medium heat, then stir in the Cream of Wheat, sugar, beer, and lemon zest. 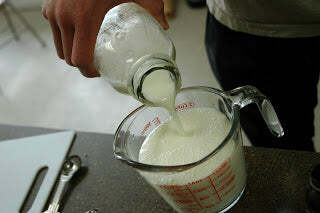 Bring to a gentle boil and cook, stirring constantly, until thickened to the consistency of heavy cream, about 1 minute. 3.) Remove from the heat and stir in the candied fruits and currants. 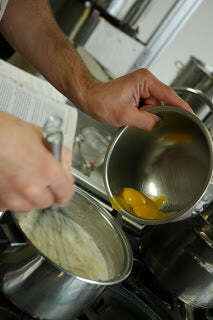 Stir in the egg yolks, one at a time, and let cool to lukewarm. Fold in the stiffly beaten egg whites. Fill the ramekins two-thirds full, or pour the batter into the springform. 4.) Bake until a toothpick inserted into the center comes out clean, about 20 minutes for the ramekins, or 30 minutes for the pan. 5.) Let cool for approximately 10 minutes before unmoulding - the pudding will fall slightly. Serve lukewarm or cold. 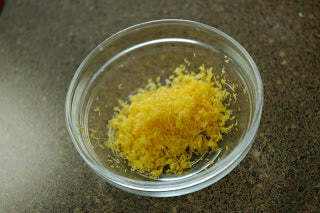 Perform a cereal mash with half of the 6-row and all of the flakes, while conducting a protein rest with the main mash. Dough-in at 122ish, heat the cereal mash to boiling over 5-10 minutes, boil 15 minutes. Add the cereal mash to the main mash, infusing to around 150. Proceed with normal saccharification/sparging/boiling, adding a mash-out if you are impatient. Note that this is not a conventional witbier recipe, but if you give the hops time to mellow, you'll be rewarded handsomely.